The Cedaru00ae hourly rate is $40. You do not need to reserve any sessions in advance, and instead you may reserve only the sessions you need. We only need a 48-hour notice in advance of your session to reserve it and to schedule the appropriate tutor for your child. Cedar Tutoring offers flexible family plans that allows you to reserve monthly sessions that can be used any time within that month, to send any registered child of yours at Cedar to use those hours as you see fit. We only need a 48-hour notice in advance of any session to allow for scheduling. 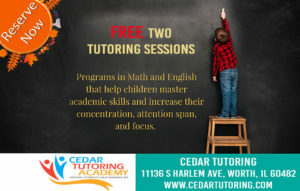 Cedar Tutoring provides specialized help for elementary, middle school, and high school grade levels. We offer help in subject areas including math, reading, writing, science, and Arabic. Our goal is to guide your child through their homework, and help them become independent learners. Our facility will offer a transportation service that will have your child dropped off right at home at a set scheduled time. Your child may be eligible for free transportation if he or she resides within a 5-mile radius from the Cedaru00ae location. So, it has been several months since I enrolled my son Adam and Mohammad in after school sessions at Cedar Academy. At first, I remember attending the open house and instantly fell in love with the school. They offered a free placement test and really seen where my children can use a little extra help. I was offered a discount package for the first month and ever since I have been please. They are very professional and E-mail weekly reports for each child and session to explain everything going on and where my children's weakness and strong points were, and what area of weakness they worked on. Their rates may seem on the higher side, but it is still very competitive, but you get what you pay for. They also helped build self esteem and confidence in my son Mohammad, and that to me is priceless and worth more than the good grades he will receive. Even if your child is a great student, they can become even better with Cedar. Thank you Asma, and the entire staff! I recommend Cedar Tutoring without reservation! Since my son began working with Asmah (one of their tutors) a few months ago, his reading has improved significantly. His NWEA assessment score shot up 20 points in just 3 months. The instructors there are amazing! They genuinely care about the kids they work with. Sometimes as a parent it's hard to get your child to focus on studying or getting them to do extra work. Cedar provides a school like setting in which your child can better focus and work with someone trained in teaching.Great and affordable tutoring!! I will continue to bring my son here. Working with Cedar has been such a joy. My 9th grader is feeling more confident than ever. We moved and she was a little behind in Math and science and now she is excelling. I recommend this program to anyone, they have great math tutoring and science tutoring in palos heights area. This had been the best investment for our family. We have a 5th grader, whom has focus issues and needs help gaining independence in his studies in a timely manner with confidence And our pre-k 4 for enrichment. The staff is excellent. My children look forward to coming here for the prizes they EARN and of course to have the rest of their evening to relax. In just 4 weeks my son has pulled his grades up a letter grade, has more confidence in his execution and overall attitude change in regards to homework and studying. As parents it was hard to keep the focus with our son. The authority is different. So! If youre thinking of joining, DO NOT HESITATE! Cedar provides a clean, healthy, safe fun environment for learning. We are looking into summer enrichment as well for both of our children. Best tutoring service in the southside by far! My family shares hours between multiple tutors and subjects (Math, Science, English, ESL). We are all super pleased. Prices were half the cost of the other companies we found and the tutors are awesome. Definitely recommend! How To Make Reading a Part of Your Child’s Daily Life?